Descendants of David and Shaneh Vidomlansky, who married in 1790. May is Jewish Heritage Month, so in its honor I decided to look into my own Jewish heritage. 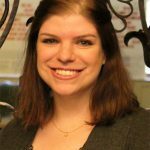 Even though I work at a genealogical society, I always felt that it was a worthless pursuit to try to trace my genealogy back many generations. My great-grandparents and some of my great-great-grandparents were the ones who immigrated to the United States in the 1910s and 1920s. Due to language differences, various names, changing borders, and not even knowing exactly where they were from (“somewhere in Russia” or “maybe Bialystock,” my grandparents would say), I never really gave it a shot. One day, however, my mom showed me a family tree tracing my maternal grandmother’s family. 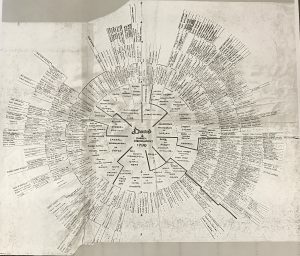 The family tree centers on a David and Shaneh Vidomlansky, who were married in 1790, and then circles out to show their descendants. As many Jewish people likely do, I had always wondered if any of my family had died in the Holocaust. Whenever I asked my grandparents about it, they assumed their aunts and uncles who stayed in Eastern Europe were killed. 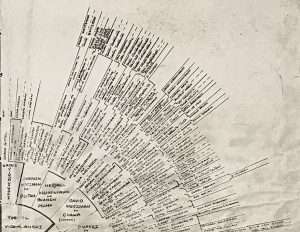 So with this family tree in hand, I decided to investigate. Detail, showing the Weitzman family. 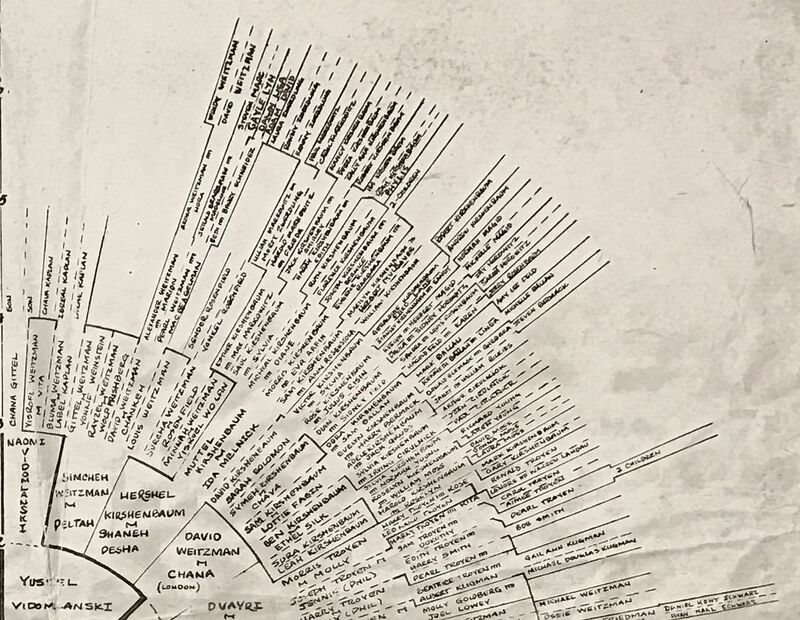 Looking at the family tree, there is clearly a branch of my family that died off. Simchech and Pelta Weitzman – my great-great-grandmother’s brother and sister-in-law – had eight children. Some of these children had their own children, but aside from one son, David, whose branch went on for a few generations, Simchech and Pelta’s other children’s branches simply ended. I figured this was a place to start. Using Ancestry.com, I learned that my great-grandfather Samuel Kirshenbaum listed Brest, Russia (present-day Belarus) as his place of birth on his World War II draft registration card. So I had some sort of geographic reference. Using the Yad Vashem Central Database of Shoah Victims’ Names, I started searching by name. I knew with different spelling and languages, this might not be easy. I did find some matches for a Bluma Kaplan, but was unable to verify if it was the right Bluma Kaplan. I did notice that two of the Blumas had Kamieniec Litewski, Poland (now in Belarus) listed as a place of birth or residence. Upon further research, I learned that Kamieniec Litewski is in the Brest region of Belarus. Was I onto something? 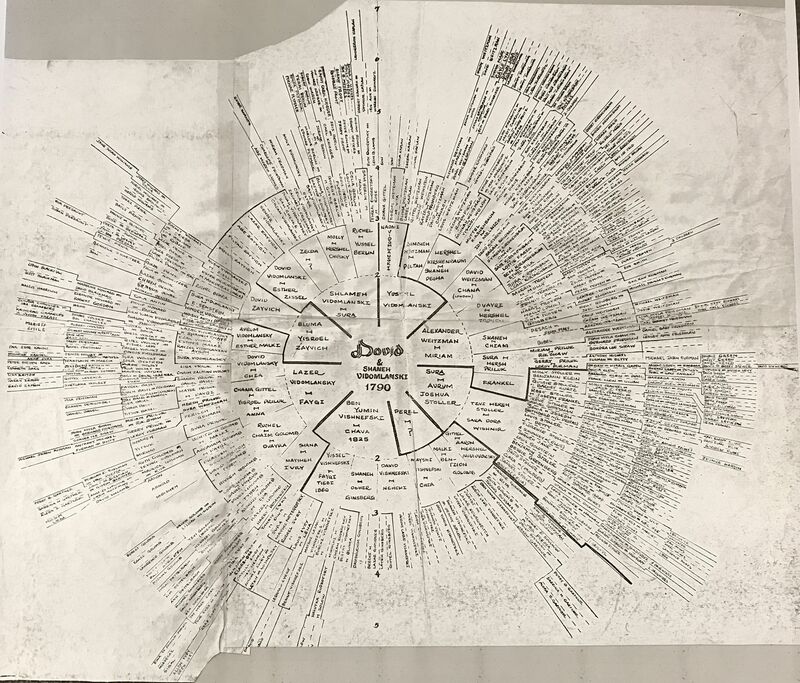 This time, in the Yad Vashem database, instead of searching for names I searched for Kamienec Litewski and soon found many names from my family. I noticed that the source of this information for these records were from Pages of Testimony submitted by a man named Azriel Kaplan. Pages of Testimony are records submitted by survivors, family members, or friends of those murdered in the Holocaust. They contain names, biographical information, and sometimes photographs. An uncle, David Weitzman, born in 1882, and his wife Annie (Chankeh) left for the United States in 1902, thereby escaping the fate of David’s siblings. They settled in the Bronx, New York, and David worked as a cigar stand keeper. The fate of Azriel’s other aunts, uncles, and cousins is unknown. Azriel also submitted further Pages of Testimony for his wife’s family. I had always assumed that family members – no matter how distantly related – were murdered in the Holocaust. But actually seeing their names among the dead stirred a lot of emotions in me: sadness, anger, bewilderment. Knowing that Azriel Kaplan survived to see so much of his family – including his wife and his two young children – killed was devastating. I don’t know what happened to Azriel – where he was sent during the Holocaust, where he went after the war ended, how long he lived – but I hope he was able to find happiness after such brutal suffering. [i] “Kamienec Litewski,” in The Encyclopedia of Jewish Life Before and During the Holocaust, ed. Shmuel Spector (New York: New York University Press, 2001), 592. I didn’t know that it was Jewish heritage month, but coincidentally have been trying to trace my own Jewish roots, recently discovered through my DNA test! Had some hunches that proved correct, but then found another line in Germany in the early 1800s who were baptized Lutheran, but with yiddish-sounding first names. (And then all the names were Anglicized when they emigrated to the US in 1846). Discovered that Jews back then sometimes converted to receive full citizenship rights. And once here in the US, they remained Protestant. Such a sad list but I am glad you found them. To the best of my knowledge I have no Jewish relatives, but I wanted to thank you for sharing this well written, heart wrenching documentation. Good work, Lindsay. I often viewed the family tree wondering whether other relatives (distant relatives) lived in the US, but my curiosity ended there. I also assumed that many of the branches ended abruptly due to the holocaust. It’s very interesting to see that many of our relatives died in the Warsaw Ghetto. Hopefully some of them died fighting the Germans during the uprising, a much better way to have died, in my opinion. Thank you for this. I have been trying to trace my husband’s Jewish ancestry for years and had some luck. I taped his mother and aunt before they died which helped and am the keeper of the family photos, such as they are. So many secrets, so much sadness. But, we must never forget.